He teamed up with his mentor Indraganti Mohan Krishna who directed Nani in Asta Chamma. After a gap of eight years, the duo teamed up together, and the movie has been titled, Gentleman. The film is said to be a thriller and Nani has been working on the script for some time. Surabhi and Niveda Thomas played the female leads in the film. It has been shot exclusively in Hyderabad, Kodaikanal, and Vishakhapatnam. 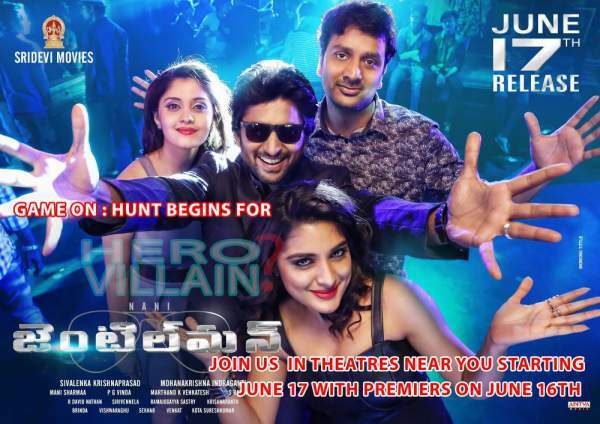 Nani will be seen in dual roles in the movie, and his performance is said to be the major highlight of the movie. The music and the trailer of the film received a wide response from the audience. The expectations reached enormous heights before the release. Manisharma made his comeback as a music director with the film, and the music of the movie along with the background score received an exceptional response from the audience. The movie released in over 2000 screens across the world and the film has been well accepted by the public. The flick received an outstanding response from the public across the world. Nani played Gowtham and Jayaram in the film, and his performance has been widely discussed all over. The suspense elements and the entertainment along with the performance by the lead actors are said to be the major highlights of the film. It opened with positive reviews, and the collections have been stable across the Telugu speaking states. The talkie released in over 137 locations in the USA, which is highest ever among Nani’s movies. The film collected Rs 7 crores across the world on its first day which is huge. Nani has been getting a comprehensive response from the audience for his breathtaking performance in dual roles in the film. Senior producer Sivalenka Krishna Prasad produced the movie on Sri Devi Movies banner. The movie is expected to mint decent money in its first weekend all over. The film is expected to mint Rs 25 crores across the world in its first weekend. Nani’s movies have done superb business all over the globe, and the movie will sure end up as a decent entertainer. The whole movie unit has been excited with the film’s success. Gentleman will end up as one of the biggest hits among Nani’s films.